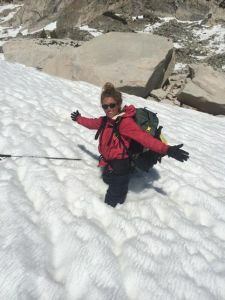 Megan Rose spent this summer hiking the Pacific Crest Trail. During her 1300 mile hike, starting at the border of Mexico and California, she summited Mt. Whitney, got caught in a snowstorm, lost her money, and dodged a bullet. She did this to raise money for the National Multiple Sclerosis Society, a disease her father has lived with for the past 14 years. You can learn more about her adventure and contribute to her fundraising at her website ms-megaventure.blogspot.com. Megan Rose, welcome to The Pursuit Zone.